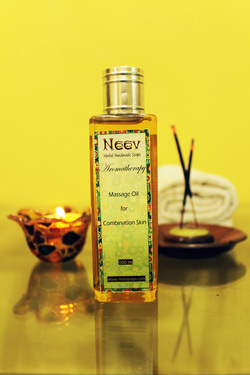 Benefits: Sesame Oil is traditionally used for a nurturing ayurvedic massage. Sesame oil bolsters ability to handle stress, promotes physical strength, nourishes muscles and bones, supports comfortable joint movements and promotes sound sleep patterns. Avacado oil is deeply penetrating and has regenerative properties. Sandalwood oil is relaxing and relieves stress.Cypress oil reduces anxiety and fatigue . Ingredients: Sesame Oil, Avacado Oil, Jojoba Oil, Pure Essential Oils of Sandalwood, Rose, Geranium, Orange, Cypress. 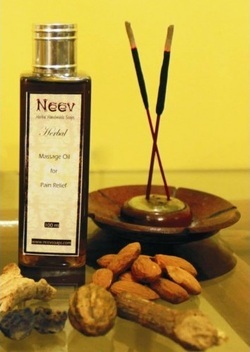 Benefits: Almond Oil is excellent moisturizer and lubricant, which prevents skin from drying; Jojoba Oil is light and penetrating; olive oil helps to remove stiffness because of its warming effect, patchouli oil tranquilizes mind and relaxes nerves, Frankincense oil is calming and promotes inner peace, lavender oil relaxes muscles and relieves tension. Ingredients: Almond Oil, Jojoba Oil, Olive Oil, Pure essential oils of patchouli, Cearwood, lavender, Eucalyptus. 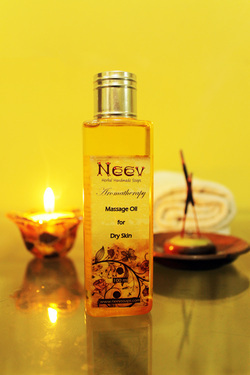 Benefits: Grapeseed oil is known for its anti aging and antioxident properties, Jojoba oil is light and penetrating, wheat germ oil is rich in Vitamin E, lemon oil invigorate body and mind, , lemongrass has a tonic, restorative effect on the nervous sysytem. Ingredients: Jojoba Oil, Grapeseed Oil,Wheatgerm Oil,Coconut Oil, Pure Essential Oils of Sandalwood, Vetivert, Lemon, Lemongrass, Rosewood. Benefits: Very useful in Joint pains. Ingredients: Sesame oil, herbs of dashmula, shatavari, manjishta, sandalwood, bala, neem, haldi, fennel, jatamansi, brahmi, eranda, clove, ginger, deodar, pushkarmula, vidari, tulsi, anantmool, camphor, black salt, licorice, Pure essential oil of Sandalwood. Ingredients: Avacado Oil is naturally loaded with many essential nutrients including vitamins(A, B, C, E and K) and minerals, essential proteins, fibres and phytochemicals. It softens skin and reduces age spots, it increases production of collagen which decreases effects of ageing. It also stimulates hair growth. Ingredients: Jojoba oil controls sebum production of skin, it is a great moisturizer, can be applied directly to face on a cotton ball for removing make up, it is good for treatment of dry nails, it also treats dry air. Ingredients: It protects cell membranes from oxidation; Helps in reducing aging signs like fine lines, wrinkles; preserves texture of the skin, and protects against damage, eczema, burns and dryness; it is rich in Vitamin E which makes skin healthy. 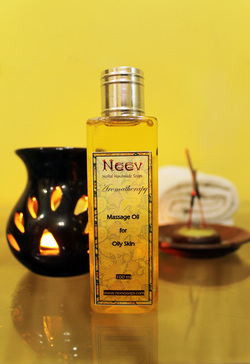 The oil also improves muscle fatigue and relieves aches.